Belfast, Beirut and Berlin all share something special – a penchant for ‘post- conflict’ street art. 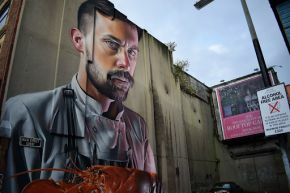 Join Omar El Masri (TJI), academics and street artists for a conversation and walking tour that explores Belfast’s street art scene against the backdrop of a changing urban landscape brought on by legacies of conflict, segregation, urban regeneration and redevelopment. Is street art a scream of political protest like we see in Athens, Cairo and Lisbon or are these walls weaving together a different story for Belfast? This event is part of the ESRC Festival of Social Science Northern Ireland.